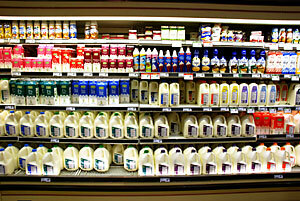 Several studies demonstrate the "light oxidized effect" on milk due to the use of fluorescent lighting in food displays. Milk loses not only flavour in this process, but also experiences nutrient losses including the degradation of riboflavin and vitamins A and D.
This information is well understood by the dairy industry but less so by retailers. Safe Spectrum® lighting has been scientifically engineered to reduce the rate of damage to milk and dairy products as compared to regular fluorescents. "...trained panelists were able to detect oxidized flavor after 15 to 30 minutes of light exposure while consumers required between 54 minutes and 2 hours." Flavor and Odor Defects in Milk (and Other Dairy Products). Food Science Department, Cornell University. Read full article here. "Oxidized Light-Induced: Odor, taste of burnt-protein, burnt-feathers, or medicinal or plastic-like taste. May progress to metallic-oxidized type flavor due to fat oxidation." "Cause - exposure of milk to sunlight or fluorescent lights resulting in protein degradation and/or lipid oxidation. Milk in unprotected or transparent milk jugs/bottles is more susceptible though this defect may occur in paper packaging if the light is intense and exposure time is sufficient." Light-Oxidized Flavor Defect of Milk. Dairy Science Facts 2002. Cornell University. Read the full Article here. Studies of Light Induced Defects in Fluid Milk: Vitamin A Loss & Light-Oxidized Off Flavors. Dairy Science Facts 2002. Cornell University. Read the full article here. New Study Validates Light Blocking Efforts: Teens Taste Light-Oxidation in Milk and Don't Like It. Kathryn Chapman. Dairy Foods (Sept. 2002). Read the full article here. Identifying and Eliminating Off-flavor Sources in Milk and Dairy Products Innovations in Dairy, March 2003. Read full article here. "A vanilla ice cream sample developed a strong putrid flavor during distribution...Elevated levels of hexanal and dimethyl disulfide clearly indicate the sample was light-abused." "Ice cream sampled from roughly half the cartons (round 1.5 gallon paperboard with a clear plastic lid) developed the defect, which formed on the top surface of the ice cream but not in ice cream from the carton interior." "Reinspection of the warehouse showed samples were stored in close proximity to high-intensity lights. Lighting adjustments were made, remedying the problem." "Another useful tactic is to control lighting conditions in supermarket dairy cases." Chapter 6 - Lipids. WebClass, Department of Food Science & Technology, University of Nebraska-Lincoln. "Oxidative rancidity causes the breakdown of fat-soluble vitamins and essential fatty acids (linoleic, linolenic), and is also responsible for the development of off flavors and odors. The warmed-over flavor common in reheated leftovers is the effect of oxidative rancidity, as is the cardboard taste of ice cream left too long in a freezer." "The presence of oxygen, metal ions, especially copper and iron, and the exposure to light will increase the rate of oxidation." "Approximately two to five percent of the top or front pieces of Cheddar or Colby cheese in supermarket retail display cases show definite evidence of pink discoloration and potential oxidized flavor. Consumer rejection of the discolored cheese alone represents a projected loss of $30 to $40 million dollars per year to the dairy industry." "'When confronted with cheese that has turned pink, the consumer will either purchase a white cheese instead, or no cheese at all,' [said Bill Wendorff, food science professor at the University of Wisconsin at Madison]...'the economic impact of the pink cheese on the top of the pile is that all the packages of cheese underneath the pink one remain untouched and unsold.'" "Wendorff identified three major factors that cause discoloration. The primary culprit is the fluorescent lighting in retail cases that catalyzes the pinking effect." "High-intensity lighting in retail display cases ranged from 300 to 600 foot candles in power. Wendorff and his team tested cheeses at 250 foot candles and found that in some cases, pinking occurred within two days at that level of light intensity. 'One can only assume that the spoilage occurs more rapidly as the light intensity increases,' said Wendorff." Antimicrobial Preservative Improves Shredded Cheese Quality and Shelf Life. Dairy Management Inc. 2003. Read full article here. "Researchers have found that the application of an antimicrobial preservative such as natamycin to cheese reduces the incidence of mold growth." "Natamycin is extremely sensitive to ultraviolet (UV) light. 'Cheese products are exposed to high-intensity fluorescent lighting in the retail dairy case, resulting in natamycin degradation on the cheese by the time of purchase by consumers,' said Marcy [of Virginia Polytechnic Institute and State University]." Dairy Management Inc. Funds Research to Improve Cheese Quality. Extraordinary Dairy Press Release, November 3, 2003. Read the full article here. "Researchers Joseph E. Marcy, Ph.D., and John L. Koontz - with funding from America's dairy farmers - [are] inhibiting mold growth on the surface of cheeses by leveraging natamycin, an antimicrobial preservative approved by the Food & Drug Administration (FDA) for use in the food industry. Natamycin is particularly beneficial when used on shredded cheeses, which are especially prone to mold." "'In terms of stability, natamycin is extremely sensitive to ultraviolet (UV) light,' said Marcy, professor of food science & technology at Virginia Polytechnic Institute and State University in Blacksburg, VA. 'Cheese products are exposed to high-intensity fluorescent lighting in the retail dairy case, resulting in natamycin degradation on the cheese by the time of purchase by consumers.'"